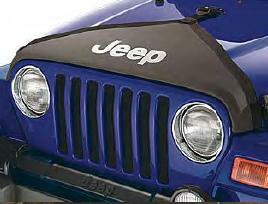 Hood Covers for the 1997-2006 Jeep Wrangler are made of durable black vinyl to help protect from gravel and road debris. Custom fit with turned under and sewn edges. Covers feature 22-ounce foss backing to help protect the painted surfaces. It can be installed and removed in minutes, and allows for the hood to be opened and closed while the cover is in place. V-style, matches top color and tire covers, with Jeep logo.